Fishermen never stop learning, but we are also victims of human nature and, therefore, are creatures of habit. We tend to stick with what we know, or at least what we think we know. Yes, to get to know something we had to start somewhere. But figuring it out takes work so once we get there it’s really tempting to just stay put. And the older we get the harder it is to veer from the known. Fortunately we sometimes get a nudge. Mine came a few springs ago on a small stream in Pennsylvania, when guide Rick Nyles of Sky Blue Outfitters politely told me I needed to set aside my nymph- and indicator-rigged, 8-foot 3-weight and start using something that was actually going to help me catch fish. That something was a 10-foot-6, 2-weight rod specifically designed for European-style nymphing. I wasn’t completely unfamiliar with Euro (or Czech) nymphing. I’d read a little about it. Seen a few videos. Knew that it was big in competition fly fishing. I felt pretty comfortable with my indicator rigs. Did I really need to tackle something new? I quickly learned that it’s not just a quirky, competition-only, best-alternative-when-bobbers-aren’t-allowed tactic. It works even for workaday anglers like myself. 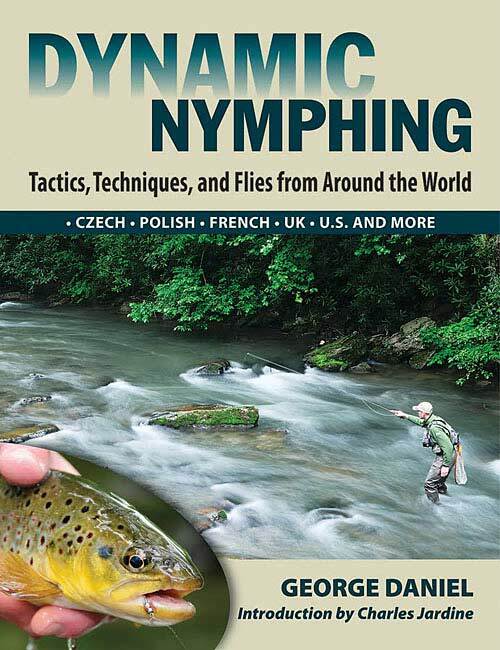 George Daniel's "Dynamic Nymphing" is a helpful primer on European nymphing techniques. Oh, I still struggled that afternoon, missing so many strikes it was almost funny. Actually, I’m pretty sure Rick and his partner Nick Raftas were laughing at me behind my back. But it didn’t take long to get the basic hang of plopping a double fly nymph rig at the head of the hole then following the flies through the run on a tight line. It’s exciting to see an indicator plunge. I would argue that it’s more exciting to actually feel a fish pop — and sometimes hammer — a nymph. I’m one of those guys who, after the nudge and some success, tends to go all-in. After that Pennsylvania trip I bought a Euro rod (a relatively inexpensive Redington Hydrogen) and went to work. I read more. I watched more videos. And I fished the Euro rig as often as I could. To be frank, one could argue that Euro nymphing really isn’t fly fishing. You don’t cast so much as you sling-and-plop the heavy nymphs a short distance. Heck, usually there isn’t more than a foot or two of fly line outside the tip top, if that. But it’s a good way to catch trout and I’ve never claimed to be a purist. I’m not very good at it yet and it would be pretty humbling to fish next to an actual expert. But I’m getting better. I’m learning where it tends to work best (pocket water, buckets and short runs) and where I’m better off using indicator rigs (long runs with consistent depth). I’m getting better at detecting strikes and better at actually hooking up. If fact, unless there’s an obvious hatch or I’m chucking streamers in high water, it’s pretty much my go-to approach these days. So I guess I’m pretty much right back where I started, just with a new habit. Mark Taylor is Trout Unlimited's Eastern communications director. He lives in Roanoke, Va., in the heart of Appalachian brook trout country and a short drive from some of the best trout tailwaters in the Southeast.